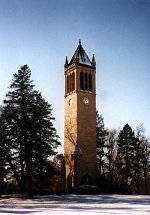 AMES - The Department of Music of Iowa State University announces the Carillon Composition Competition 2017. The purpose of the competition is to encourage the writing of original carillon compositions by young composers under age 35. The submitted work shall be an original composition for four-octave carillon (c0 to c4) with a two-octave pedal board. The composition may be a solo, a duet for one carillon or a work for carillon with one or more other instruments or chorus. The composition shall be 4 to 7 minutes in length. A transcription or arrangement will not be accepted. The prizewinner will be awarded USD 500 in cash. The winning composition will be premiered during the ISU C-HOP Festival 2017. Upon acceptance of the award, it is understood that the rights for the premiere performance will be granted by the composer to the festival. The judges are Luc Rombouts, Jeffrey Prater, and Tin-Shi Tam. They reserve the right not to award a prize if the submitted compositions are not of a satisfactory level. Note that the decision of the judges is final. The submitted composition must be postmarked no later than August 15, 2017 and sent to: Carillon Composition Competition 2017, Iowa State University, Music Department, 149 Music Hall, 2427 Union Drive, Ames IA 50011, USA. More information about how to submit a composition can be found on the website of the university via the following link: . It is also possible to contact university carillonneur Tin-shi Tam by phone +1 (515) 294 29 11 or e-mail .